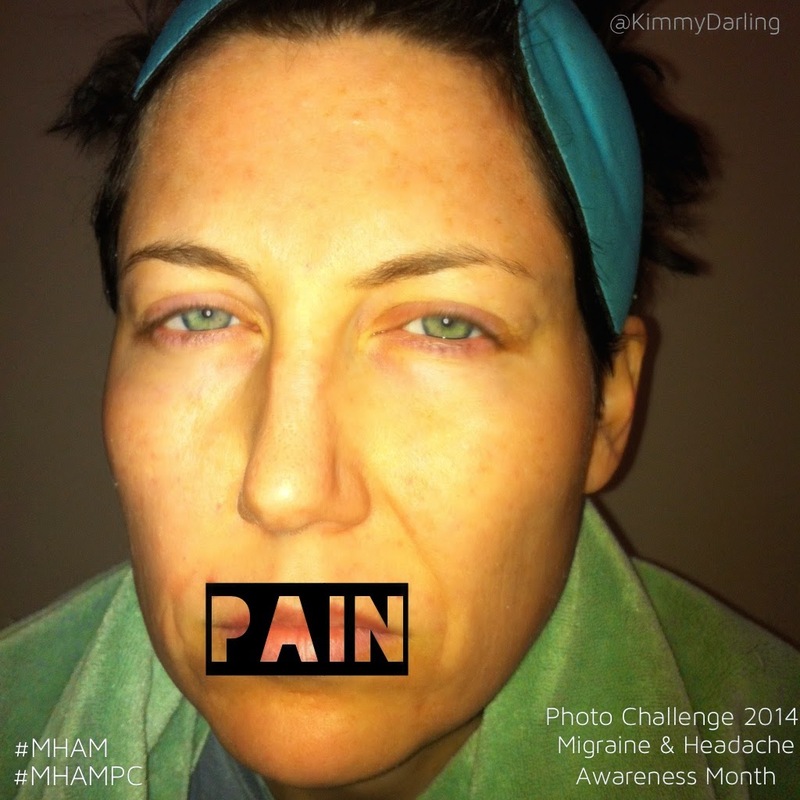 Migraine & Headache Awareness Month continues, as does the daily Photo Challenge. I have to keep reminding myself that, in participating in this challenge, 1) it's called a "challenge" for a reason, and 2) I'm "taking one for the team," for the purpose of spreading awareness, which is very important to me. So, if I'm committed to shining light on my illness, I have to share the grizzlier parts of my day-to-day, and that's that. But you wouldn't believe how I stall when I'm ready to send a photo out. (Notice, I'm a day behind-- not because I missed a day, but because of the stalling!) The Cringe-Factor is off the charts, so I pretty much hate it, and it's only Day 4. (Adding it to the Discuss In Therapy list...) But whatever. I'm not quitting, so let's just get on with it. Today's prompt is "pain," and it's one of the grizzlier ones. I mean, how do I open the door and show just anybody who wants to look the reality of the pain that has come with my having Chronic Daily Migraine for ten years, and "Just Chronic" (ha) for the decades before that?! ("Here are my scars and other open wounds, if anybody might wanna take a look at em...") It feels incredibly daunting. And gross. And I don't want to. But, the truth is, it's often unspeakable. Sometimes, it's so bad that I find myself holding my breath, because even the slowest, least detectable movement of air through my system makes it worse. Not often, but enough to know it well. On a daily basis, though, no matter the severity, if there's pain, it's pretty soul-crushing. Profoundly disappointing. A rotten, daily betrayal by my own body. My pain is a bully, hiding in the bushes, waiting to beat me to a pulp, and drag me into a dark basement, so he can do it again, whenever he feels like it. A nightmare. A saboteur. An enemy I'm forced to live with, and take with me everywhere. But I do, and I have, and I will, and I cling to my faith that, even at its worst, all is as it should be, and that there is a lesson in each moment I endure it. I hate the way all of those descriptions sound, because they have such a heavy, poisonous energy wrapped up in them, but I know that to tell it without it would be a lie. The way I look at the world is through a lens of gratitude, which is making it really difficult to fight the urge to write a paragraph that balances out all that dark, negative stuff with a list of blessings. I know that's the lesson here, though. I know I have to let them just hang there, and stay there, and let them just be what they are. Pain is a cruel, cruel monster. A horror. That's enough. I did it. Thanks for reading. If you suffer from migraines, or you'd like to know more about it, and how it affects real, live people, feel free to check out and/or subscribe to my Migraine list on Twitter: Migraine Tweeps & Resources on Twitter. As always, thank you for your interest. June is Migraine & Headache Awareness Month!